NOTE: This is part of my -2nd GRADE NO FRILLS BUNDLE - you might rather check that out than purchasing a single item! 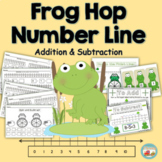 =) This is a pdf file of 2 worksheets with answers. This is a no frills exercise designed specifically to address the “make 10” strategy for these Common Core standards: 1.OA. 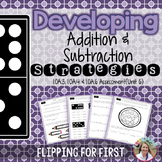 This is a set of 2 Math games that help meet the First Grade Common Core Standard of 1.OA6: Add within 20. There is a Center Card with directions for each game. Both games need 2 dice and the game board printed out. The first game is called Roll and Write. The second game is called Race to the Ball. Here is a safari-themed unit on basic subtraction to 10. 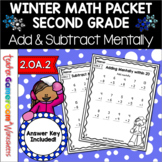 This is based off of the Operations and Algebraic Thinking Common Core Standard 1.OA.6 - Add and Subtract within 20. 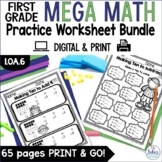 Worksheets are provided for zero to 10. Answer Keys are included as well as review sheets. Graphics from Scrappin' Doodles. 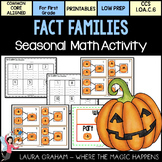 Fact-O-Lantern Fact Families CCS 1.OA.6.